In a perfect world, this album would've been the followup to Neon Indian's globe conquering single "Sleep Paralysist," a song so good it should've turned Alan Palomo into one of the biggest stars of his generation and bought him a spaceship made of diamonds. That it isn't is just one more piece of evidence (in case anyone needed it) that we do not, in fact, live in the best of all possible worlds. Alas, Era Extraña is only the followup to a well-received indie album, Psychic Chasms, that made Neon Indian something like the Prince of Chillwave. There is very little of Psychic Chasms on this album, though--the song that sounds most like that album is the title track, oddly enough--and it's hard not to blame Palomo from moving on. The album bears the marks of its creation during a wintry few weeks in Helsinki (a pretty intense experience from the sound of it: "After being in Helsinki for four weeks, there was this Werner Herzog monologue happening in my head, driving me crazy, like, [in Herzog accent] 'What is music? '"), which makes it less summery than Psychic Chasms and decidedly less "chill." If you're not getting chillwave from a Neon Indian album, though, what are you getting? In some ways, this is much more of a straight electro-pop record, but an electro-pop record that makes Palomo's debt to My Bloody Valentine (really only clear in the guitars towards the end of "Deadbeat Summer" on his debut) more apparent and that gives a nod to LCD Soundsystem style disco (on the album's highlight, "Suns Irrupt," which would fit nicely alongside "Get Innocuous"). Era Extraña starts off with a scene-stealing instrumental, "Heart: Attack"--the first part of a three part suite scattered throughout the album--which borrows the amazing liftoff from "Sleep Paralysist" in service of an opening every bit as revelatory as "Wildlife Analysis." The first half of the album foregrounds the shoegaze ("Blindside Kiss" wouldn't sound out of place on MBV's You Made Me Realise EP, one of his favourites, apparently), but also introduces a new, more vinegary sound to Palomo's synth palette (used to good effect on the swirling "Polish Girl"). 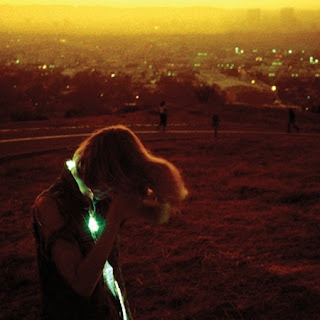 There are times that the album gets a little too easy--it's impossible to say "Hex Girlfriend" and "Fallout" are anonymous given how much they sound like Neon Indian (and who else right now uses gasps quite as well as he does in his vocals?) --but over a flat out amazing second half the album really commands the listener's attention. "Future Sick" is the big pop moment that "Fallout" thinks it is, and "Heart: Release" is the funkiest thing he's released since "Ephemeral Artery." This is to say nothing of "Suns Irrupt" a droning epic that (hopefully) points the way forward to something like his Sound of (Neon) Silver and "Arcade Blues," a return to the shoegaze of "Blindside Kiss," but fitted out in chrome and neon.